I admit it; I am a CHANEL base addict. I think when it comes to base products (i.e. 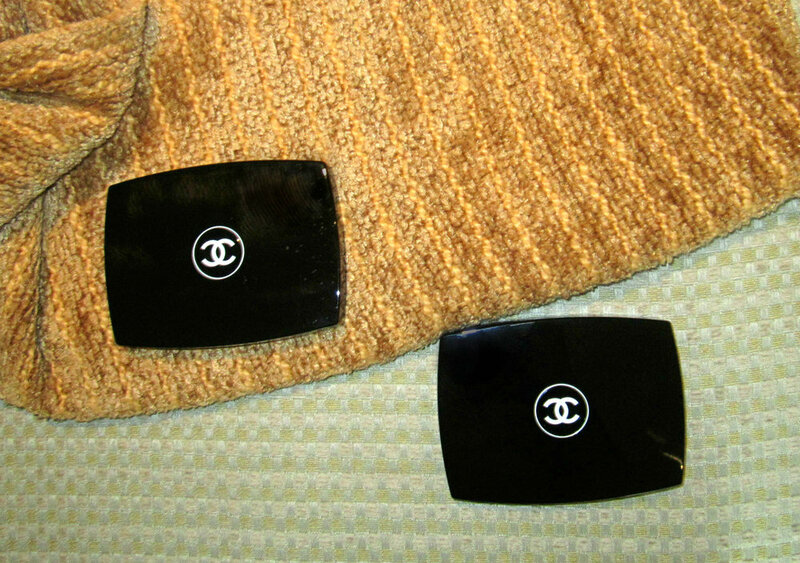 foundations, powders, concealers) CHANEL really does a great job at creating products that make your skin look flawless. My “holy grail” powder is the CHANEL Mat Lumière powder ($64) but I recently branched out from my staple product and tried the CHANEL Vitalumière Compact Douceur ($66). Even though the packaging is exactly the same, there are some significant differences between the two. I started using powders early on because as a teen I had very oily skin. My staple base makeup during that time was the Stila Sheer Color Tinted Moisturizer and Stila Perfecting Concealer, with a powder foundation over top to add a bit more coverage and keep the shine at bay. I still love using powder foundations over top of sheer coverage liquid foundations or even alone on hot summer days. CHANEL Mat Lumière is an oily skin girl’s best friend. It definitely mattifies but doesn’t leave a chalky or cakey finish on the skin. I’ve used this powder through horrible breakouts and it really does a good job at not only setting my makeup for the day but also adds quite a bit of coverage. If you have dry skin or any dry patches on your skin I would proceed cautiously with this product. I find that it does tend to cling on to dry spots leaving an uneven finish, especially after having it on the skin for a few hours. This is definitely more for oily girls. The Vitalumière Compact still sets makeup beautifully but leaves a bit of a dewy finish on the skin. The powder is very lightweight, more so than the Mat Lumière, and has a bit less coverage than the Mat Lumière. It also works beautifully if you want to reapply throughout the day; sometimes I find that the Mat Lumière looks a bit too thick on my skin if I reapply in the middle of the day. If you have more normal/combination skin this is for you but if you really need to mattify your skin I would go with the Mat Lumière. I really do like both of these powders but as my skin is becoming more normal/combination than oily I’m actually reaching for the Vitalumière Compact powder over the Mat Lumière. This blog post was only going to be about these powders but today I got my makeup done at the CHANEL counter at Hudson’s Bay in Yorkdale Mall with all the new Fall releases. Every couple months CHANEL holds makeup events where you can have a makeup artist do your makeup. These events really help you to see what products work best for you. All the sales associates and makeup artists at Yorkdale are always extremely friendly and talented (I always get great makeup tips). I’m going to do a more comprehensive post next week but I thought I would give you some of the highlights. Firstly, the new Vitalumière Aqua loose powder is GREAT - I think I might like it more than the Vitalumière powder compact I just talked about. The Rouge Coco Shine lipsticks in 95 Viva and 96 Aura are absolutely gorgeous; a must for fall. The blush in 160 Innocence is great for a cool, naturally flushed look. Last but not least, the Les Ombres Multi-Effect Quadra Eyeshadow in Poésie is a great mauve based palette that is a total winner.